Oscoda's Zach Ouilette needs only one arm to pin an opponent during Saturday's district meet. 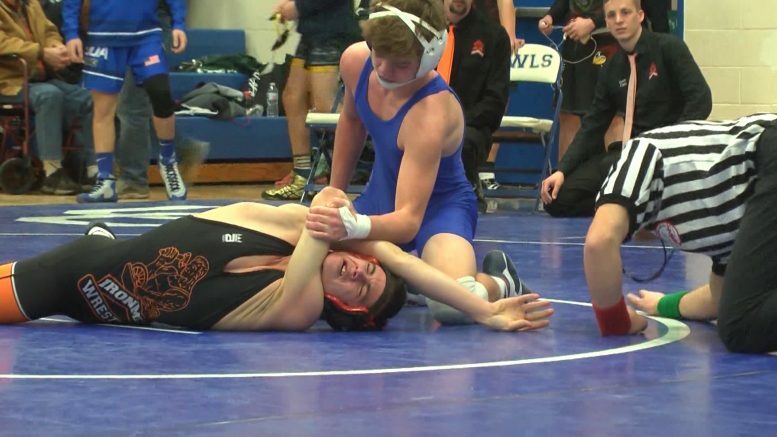 Oscoda, Mich — The Owls hosted their own wrestling district as the post season gets underway. Wrestlers from Evart, Fife Lake Forest Area, Frankfort, Houghton Lake, Lake City, Leroy Pine River, Mancelona, Manton, Mason County Central, Mio, Oscoda, Roscommon, Traverse City St. Francis, and Whittemore-Prescott all made up the district. The participants were ranked and seeded ahead of the district competition. An individual needed to win four consecutive matches to win their weight class and guarantee a spot in the regional tournament. Consolation rounds were also held to determine third and fourth place winners. Anyone placing fourth or better advanced to the regional round. Fifteen athletes from Oscoda, Mio, and Whittemore-Prescott are advancing to the regional round in Charlevoix. Tyler Demory, Mio, 103, 2nd. Adrien Fragoso, Whittemore-Prescott, 103, 3rd. Brandon Alcayde, Mio, 119, 1st. John Edwards, Oscoda, 119, 4th. Zach Ouillette, Oscoda, 125, 1st. Anthony Ward, Oscoda, 130, 1st. Kolton Peters, Mio, 135, 4th. Kyle Fenner, Whittemore-Prescott, 145, 2nd. Robert Host, Oscoda, 152, 4th. Dakota Gagnon, Whittemore-Prescott, 160, 1st. Andy Dault, Oscoda, 160, 2nd. Will Ciske, Mio, 171, 2nd. Ridge Schutte, Whittemore-Prescott, 189, 1st. Christian Ward, Oscoda, 215, 3rd. Sonny Fragoso, Whittemore-Prescott, 285, 3rd.